A number of eukaryote lineages that branched very early in eukaryote evolution are still extant today. Most of them have no fossil record at all. However, studying these protists is important for what it can tell us about the earliest steps in eukaryote evolution. These primitive eukaryotes are also important in medicine and veterinary science: some cause human and animal diseases such as giardia (hikers' diarrhea) and trypanosomiasis (African sleeping sickness). Yet others live in symbiotic relationships with other organisms: the flagellate Streblomastix shown above lives in the intestines of termites, and it and several other protists assist in the digestion of wood. The relationships among these protists were not clear until the advent of techniques such as electron microscopy and DNA sequencing. A picture of the "family tree" of the early eukaryote lineages is just beginning to arise. For now, we will simply list some of the important groups of basal protists, and provide sources of additional information on the Internet. Amoeboflagellata -- Sometimes called the Schizopyrenida, amoeboflagellates are small, colorless protists. Most can transform between amoeboid forms (known as trophozoites)and flagellate forms; an amoeba that encounters water can grow two flagella and swim away, reverting to the amoeba stage upon encountering food (in most species, the flagellate cannot feed). Amoeboflagellates can also form cysts that are resistant to extreme conditions; these can lie dormant for decades before returning to life. Amoeboflagellates thus can live in changeable habitats; they may be extremely common in soils. A few species that are adapted to live at human body temperature are normally free-living but can cause serious and usually fatal brain infections if introduced into the body -- fortunately, this is rare. Comparisons of rRNA sequences have shown that amoeboflagellates are most closely related to euglenids and to kinetoplastids. Their fossil record is extremely sparse and extends back to the Cretaceous. Data on the pathogenic amoeboflagellate Naegleria fowleri are available from MicroWeb. Diplomonadida -- Diplomonads are small heterotrophic protists with no mitochondria. Some diplomonads are free-living and may be common in stagnant fresh water, but most are commensal in the intestines of animals. Some are parasitic and cause disease; in humans, the diplomonad Giardia infects the intestine and can cause diarrhea (a disease known as giardiasis, or "hiker's diarrhea"). Although diplomonads have no hard parts and completely lack a fossil record, recent studies of the ribosomal RNA of diplomonads have shown that they form one of the earliest branches of eukaryote evolution. Images of Giardia are available from Cells Alive! More information on Giardia is available from MicroWeb. Euglenida -- Euglenid protists are generally elongated cells that possess one or two flagella; there are about 1000 species. 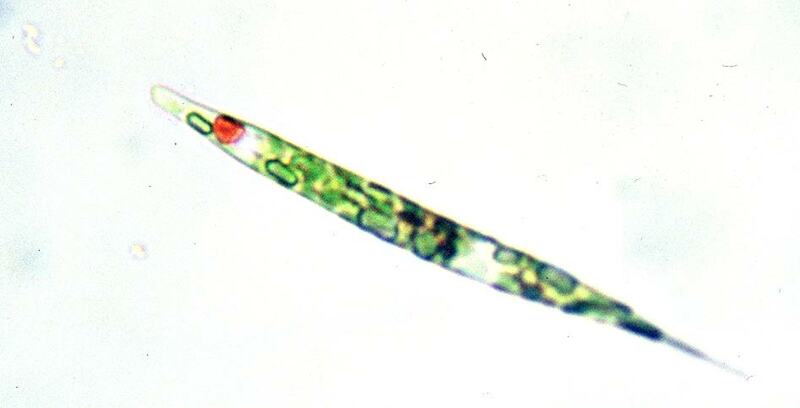 While many are photosynthetic and have chloroplasts, some euglenids lack chloroplasts and are colorless. The euglenid cell is covered by a flexible coat, the pellicle, that allows the cell to change shape; euglenids can swim using their flagella but can also creep using a peculiar type of "inching" locomotion known as metaboly. Most known euglenids live in shallow freshwater habitats enriched in organic matter, but some live in marine or brackish waters, and a few are parasitic in animals. Aside from one possible Silurian fossil, a curious microfossil called Moyeria, the sparse fossil record of euglenids is restricted to the late Tertiary. Visit Euglenoid Project website for current information about Euglenid biology and systematics. Kinetoplastida -- Relatives of the Euglenida, kinetoplastids include two main groups of small, flagellated protists: the bodonids, which are free-living and common in freshwater habitats, and the parasitic trypanosomes. The best-known trypanosomes are those in the genus Trypanosoma that cause human diseases such as sleeping sickness (in equatorial Africa) and Chagas' disease (in South America). A related protist, Leishmania, causes the disease leishmaniasis, or kala-azar. These trypanosomes are transmitted by biting flies, and are a serious public health problem in much of the world. Molecular studies have shown that kinetoplastids are probably related to the euglenids and amoeboflagellates. They lack a fossil record. More information on Chagas' disease, leishmaniasis, and African sleeping sickness is available from the World Health Organization Division of Control of Tropical Diseases. MicroWeb has information on parasitic kinetoplastids, or hemoflagellates. Or try the list of trypanosome and Leishmania resources maintained at the Institut Pasteur. Parabasalia -- Parabasalians are found only in association with animals. Some are pathogens; for instance, the parabasalian species Trichomonas vaginalis causes a fairly common sexually transmitted disease in humans. Parabasalians are more commonly found as commensal or beneficial symbionts; other species of Trichomonas live commensally in the human mouth and gut. Parabasalians also include many forms found in the guts of roaches and termites. These protists in turn contain symbiotic bacteria that break down cellulose, and some of these parabasalians move by means of thousands of symbiotic bacteria attached to their outer membrane and propelling the host forward. It is because of these protists and their bacterial symbionts that termites are able to feed on wood. Parabasalians lack mitochondria, and all are anaerobic. MicroWeb has information on Trichomonas vaginalis. Pelobionta -- Pelobiontids, or karyoblasteans, are large (up to 1 mm long), free-living amoeboid protists living in freshwater muds in temperate habitats in the Northern Hemisphere. Only about four species exist, all in the genus Pelomyxa -- and three of these species may turn out to be synonymous with the first species described, Pelomyxa palustris. Pelomyxa can tolerate very low oxygen levels; these protists lack mitochondria completely, but contain several types of symbiotic bacteria that fulfil the same function. Pelomyxa thus shows what eukaryotes were like at a very early stage in their evolution, before the appearance of true mitochondria. No fossils are known. Visit the Tree of Life for more information about the relationships among the basal eukaryotes. Or visit Cells Alive! for information about parasitic microbes. Source: Margulis, L., Corliss, J.O., Melkonian, M. and Chapman, D.J. (eds.) 1991. Handbook of Protictista. Jones and Bartlett, Boston. This photograph of Streblomastix was provided by Erol Kepkep.